A blind French girl's and a German boy's paths collide in occupied France as both try to survive the devastation of World War II. Marie-Laure lives with her father in Paris near the Museum of Natural History, where he works as the master of its thousands of locks. When she is six, Marie-Laure goes blind and her father builds a perfect miniature of their neighborhood so she can memorize it by touch and navigate her way home. When she is twelve, the Nazis occupy Paris and father and daughter flee to the walled citadel of Saint-Malo, where Marie-Laure’s reclusive great-uncle lives in a tall house by the sea. With them they carry what might be the museum’s most valuable and dangerous jewel. In a mining town in Germany, the orphan Werner grows up with his younger sister, enchanted by a crude radio they find. Werner becomes an expert at building and fixing these crucial new instruments, a talent that wins him a place at a brutal academy for Hitler Youth, then a special assignment to track the resistance. More and more aware of the human cost of his intelligence, Werner travels through the heart of the war and, finally, into Saint-Malo, where his story and Marie-Laure’s converge. It was the best of times; it became the worst of times. It was an age of enlightenment; it was an age of cruelty. It was a season of unity; it was a season of tragedy. Marie-Laure LeBlanc and Werner Pfennig had everything, until they lost everything as World War II consumed their world. All the Light We Cannot See captures the duality of two children as they struggle to make sense of the chaos pervading their lives. In France, Marie-Laure and her father flee the rapidly approaching terrors of the Third Reich. She has, by this time, lost her sight completely and must learn to make new meaning for her blind world, while her father harbors a terrible secret that must be kept from the Nazis at all costs. In Germany, Werner desires a life greater than that of the town radio mechanic. He yearns for the invisible world of radio waves and the physics of nature, of engineering and mathematics. But neither of them sees the invisible threads of fate that bind them together. Their journeys will redefine their understanding of the physical and moral world in which everyone lives. 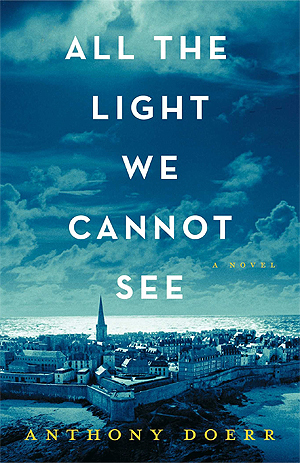 Through this novel, author Anthony Doerr paints a moving picture of a world that is both overflowing with hope and possibility, and plagued by unimaginable tragedy. Doerr’s writing style is reminiscent of Markus Zusak, whose rich images and well-defined style brought the unforgettable story of The Book Thief to life page-by-page, sentence by sentence. The vivid use of colors to describe how Marie-Laure interprets her sightless world is absolutely wonderful. Doerr also demonstrates himself as a masterful storyteller. He slowly builds up to a truly meaningful and haunting final encounter between Marie-Laure and Werner. However, I could have done without the “Sea of Flames” subplot; while interesting as its own story, it did not, in my opinion, add much to the main storyline, and I think the characters and novel as a whole had more than enough meaning without it. That being said, All the Light We Cannot See is a beautiful literary experience, one that captures the often unfair, uncaring duality of life. Yet, amidst all the chaos of the time we find two young people able to make new meaning for themselves and those around them, a message of hope that, I think, speaks poignantly to contemporary society. I had high hopes for this book after reading some reviews, but once again I found that it didn't live up to its reputation. The story was slow, the characters boring and the writing jarring. Very ho hum! It was a great read. I picked it up towards the end of my summer break and finally picked it up again at the end of the quarter, and it was so easy to just get right back into it. I thought that the two story lines, as well as the jumps in time, were great, and I loved that we repeatedly were suddenly reminded about the dire situations that both characters were in, all while the flashbacks went on to, bit by bit, help us understand how they got into such dire situations. However, I did feel somewhat unsatisfied by the ending. Maybe it was because I hadn't picked it up in so long, but it felt as though, yeah it was a reasonable way to tie up all the story lines, I didn't get the payoff I expected after my emotional investment. Still, it was a great book. Loved this book!! If you are interested in ww2 you shouldn't definitely read this book. If you are interested in historical fiction you should read this. If it even sounds remotely interesting you should pick it up. You really should, it is amazing. I picked this up last summer after a friend reccomended it. I brought it on vacation with me and spent a whole day in a hammock completely engrossed in the novel. I loved everything about it. The pacing, the prose, the characters, and the story of course. I've reccomended it to several people since, and I haven't met anyone yet who didn't enjoy it.